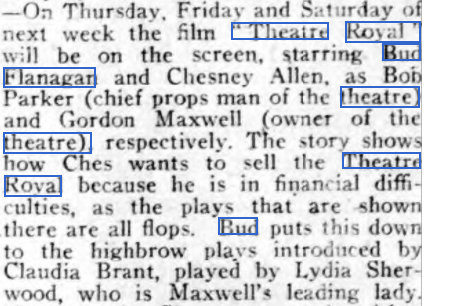 Charles Mortimer played Mr Bowman, in the film, Theatre Royal, starring Bud Flanagan and Chesney Allen, who were members of the famous Crazy Gang. ​Scenario - The property man at a theatre which is on the point of being sold, rallies friends and puts on a show which gets the backing of a U.S. impresario and saves everyone. From The Bucks Herald - Friday 20 August 1943.